If there is a bright side to living with Parkinson's, it is the friends we make on our journey, who help us live each day to its fullest – laughing in the face of our shared challenges and fears and celebrating even the smallest of victories. My friend Jo-Ann and I not only share Parkinson's, but also a life-long passion for shopping, which can't be blamed on the dopamine agonists we take. On good days we're energized to lunch and shop, and on bad days we lunch and shop to energize ourselves. This explains why retaining our mobility is so important to us. Recently, Jo-Ann started carrying a cane, "carrying" being the operative word. She insists she doesn't need it, but promised her doctor she would bring it along on "serious" shopping outings. What other kind are there, I wondered to myself? Jo-Ann's doctor failed to impress upon her that achieving the desired results requires the cane be used as a walking aid, and must make contact with the ground. Jo-Ann uses her cane as a shopping aid, extending it in front of her like a divining rod, until she finds a clear a path to the sale merchandise, much as Moses parted the Red Sea. Don't be fooled by Jo-Ann's diminutive stature. Watching her work a clearance sale and scatter the shoppers about is a sight to behold. Jo-Ann is adjusting to using her cane now that she got herself a fashionable one that uses laser technology to interrupt her "freezing" episodes. I have had to catch her only once as she started falling backwards on an icy walkway. Jo-Ann insisted that it was not her Parkinson's that caused this, but rather the blustery Chicago wind which picked up her size 00 body and transformed it into a sail. When Jo-Ann first reached out to me five years ago at the wellness center where we both exercise, I never imagined how quickly we would bond, what our friendship would mean to each of us, and how long it would endure. 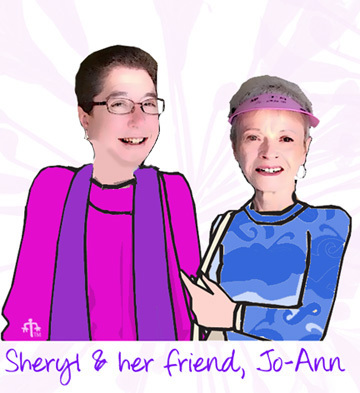 I wish you all a Parkinson's pal like my friend Jo-Ann.